Novelty singles: you either love them or loathe them. I was only a child when this single was released in 1982, and I was definitely in the 'love' camp. For years I didn't think much of this track, and now that I have a child of my own I can't wait to play it for her when she's a little older. 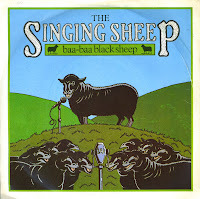 'Baa baa black sheep' is an existing English nursery rhyme. The words are not sung in this version - after all, sheep cannot talk. The single actually reached number 42 in the UK singles chart in December 1982.